Shanghai’s local speciality coffee shop/roasters have been making in-roads when it comes to high-profile locations such as shopping malls (in addition to Little Bean, Seesaw, Mellower, Manner and Japanese imports, % Arabica, all have at least one branch in a mall). I have mixed feelings about this. While I’m delighted that such excellent coffee is available in mainstream settings, malls are absolutely not where I want to come for coffee. A little part of me died just walking through the doors of K11… That said, Little Bean’s done a great job of creating a modern, welcoming space, worth visiting in its own right and definitely worth it if you need a break from being a tourist in central Shanghai. K11 is on Huaihai Middle Road, just south of People’s Park/Shanghai Museum. Meanwhile, the Huangpi South Road station on Line 1 of the Shanghai metro is right outside, with Exit 2 connecting it with both K11 and the neighbouring Xintiandi Mall (home to % Arabica) to the south. Turn left on leaving the metro, walk straight ahead into K11 and you’ll find Little Bean straight ahead of you, so you don’t even set foot in the mall! Alternatively, if you enter via K11, head down to the second basement level (B2). Little Bean has a central island counter (consisting of two long, parallel counters, each terminating in a large, rectangular pillar) surrounded by seating on all sides. The front counter, where you order (and are tempted by the cakes) has its pillar, which holds the retail selection, to the right. Home to a row of six V60s, it has a matching row of stools, so you can watch your coffee being made. The rear counter has its pillar, which holds a charging station, to the left. This is the espresso side of the operation, with a single La Marzocco Linea and two grinders, a Mazzer (espresso) and an EK43 (filter). There’s also a row of stools on this side, with both counters broad enough so that you can treat them like tables. If you don’t fancy being up close and personal with the baristas, there are two further sections of counter-style seating. Two long, rectangular counter-tops run in front of Little Bean, while at the back are three counter-tops with rounded ends, one long (eight-person) and two short (four-person). Finally, there’s a long, curved bench to the right of the island counter, with five round tables, complete with chairs, while to the left are two shorter, semi-circular benches, each with three tables. These have a six-person, round counter-style table in the middle, plus another round table between each bench and the island counter. On my first visited in 2017, Little Bean offered a second single-origin on espresso and four on pour-over. I went for a washed Kenya AA Kiangai through the V60 which wasn’t bursting with the juiciness that I normally associate with a Kenyan. Instead it was a subtle, refined, sweet coffee which tasted just as good cold as when hot. I paired this a rich and creamy cheesecake (sadly, unlike the Little Bean Roastery, there’s no freshly-baked bread). On my return last week, Little Bean had cut back its offering to a single Brazilian on espresso and pour-over, plus two (more expensive) Nordic Approach options on pour-over. The Ethiopian had sold out, so I had the Costa Rica Santa Teresa Geisha. This was quite superb, a lovely, delicate, subtle, floral coffee, maintaining Little Bean’s very high standards for pour-over. I paired this with an equally awesome almond croissant. I sometimes find almond croissants disappointing, but this was the exact opposite: light, flaky pastry, gooey almond paste filling and abundant almonds on top, it was as good as it gets. 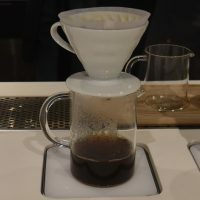 This entry was posted in Basements, Cafe/Roaster, Cake, Coffee Shops, Evening Opening, Island Counters, Laptop Friendly, Late Opening, Retailers, Shanghai, Shopping Malls and tagged AroundTheWorld2019, include, LittleBean by Brian Williams. Bookmark the permalink.